Whether it’s the cup of coffee every morning, or the red wine to relax at night, several things can contribute to a dull or dingy smile. And that’s the last thing you want on your wedding day! At my dental office in Lewisburg, we can transform your smile to wedding-white with professional whitening. 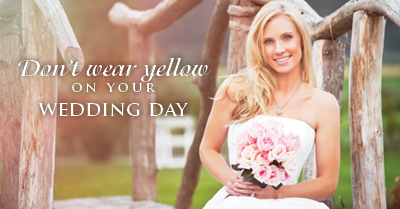 Professional whitening can help make your smile dazzling for your big day. The best part? We can often whiten and brighten your smile in less time than over-the-counter whiteners. And while whitening your smile may seem simple and harmless, it’s best to consult your Lewisburg dentist before you decide on the best solution for you. Over-the-counter whitening kits may seem like the ideal solution to get your smile whiter. They’re often a cheaper option and you can whiten at home, in your car, or wherever you want. However, it’s important to know that whitening without a professional recommendation or supervision can lead to some unwanted side effects. For example, in many over-the counter kits, the strips or mouth pieces can allow the bleaching solution to touch the gums or other tissue, which can cause irritation. Additionally, some products that you find at your local drugstore can lead to tooth pain if the formula is too strong. On the other end of the spectrum, the solution can be too mild to yield desired results. An alternative is a professional whitening at our Lewisburg dental office. Whitening your smile with us is safer, as custom trays are used and protective measures are taken to avoid any gum irritation. A professional smile whitening also tends to last longer as opposed to an over-the-counter choice. If you’re ready to whiten your smile this wedding season, give my office a call today! We’ll discuss your smile whitening goals and determine the best solution for you. If a professional whitening isn’t appropriate for your smile, don’t worry. We can still help you get the look you want by using porcelain veneers or tooth bonding. No matter what solution we decide on, you’re sure to get your smile wedding white! April is Oral Cancer Awareness month and I’d like to make sure all of the patients at my Lewisburg dental office recognize how serious oral cancer is, know the risk factors associated with oral cancer, and understand the steps you can take to help with early detection. 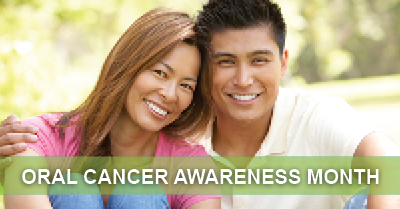 The American Dental Association estimates that 42,000 people will be diagnosed with oral cancer this year. Of the 42,000, only a few more than half are expected to survive longer than five years after diagnosis. While oral cancer is not particularly difficult to treat, the fatality rate is so high because the cancer is often caught too late. This is why a proactive approach to early detection is so important. A self-exam performed every month at home can help catch oral cancer early, and can contribute to successful treatment. Once a month, grab a mirror and a bright light and check out your mouth for some of the common symptoms of oral cancer. Some things you should look for are red or white patches of tissue, a sore that doesn’t heal on its own, abnormal lumps or thickening of tissues, and difficulty swallowing. In addition to your once a month self-exam, it’s very important that you keep your regularly scheduled appointments with your Lewisburg dentist. While it’s common for oral cancer to not seem to have any symptoms early on, our team is trained to see and catch any suspicious areas. Again, an early diagnosis means that we can start treatment before the cancer gets too widespread and greatly improves your chances of survival. As with almost any disease, there are a variety of risk factors that can increase your susceptibility to oral cancer. Tobacco use, in addition to heavy drinking, are the most common factors that contribute to oral cancer. Furthermore, the sexually transmitted human papilloma virus (HPV) can also put someone at increase risk for oral cancer. If you’re experiencing any of the symptoms we’ve discussed, if you’re at increased risk for oral cancer, or you are in need of a checkup, call my Lewisburg dental office as soon as possible. I can’t stress enough the importance of early detection and early treatment. Don’t put your life in danger. Schedule an appointment today.